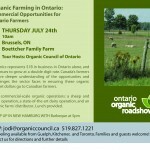 The use of the term “organic” in Canada just got a little clearer, and the Organic Council of Ontario hopes the that New Brunswick’s new regulation leads to similar legislation in Ontario. On June 16th 2014, New Brunswick announced that it would be joining Quebec and Manitoba by creating a provincial regulation that defines and controls the use of the word “organic” within the provincial context. New Brunswick has adopted the federal definition of “organic”, references the same standards and will rely on the same system of federally-accredited Certification Bodies to ensure that organic operators comply with organic standards. As in the federal system, NB’s approach to enforcement will be complaint-based. The regulation will close the provincial gap in the national network of laws governing use of the word “organic” in NB and will provide assurance to consumers that all food promoted as “organic” is subject to the same regulatory requirements no matter where it is produced. 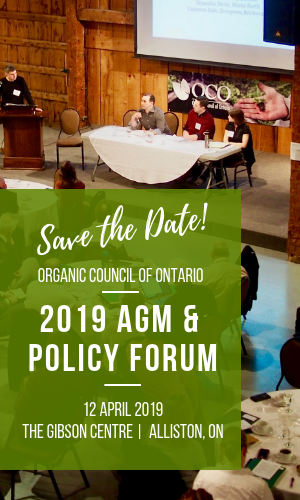 “The case for such legislation in Ontario is simple, producers and consumers alike deserve clarity in the marketplace,” said Jenn Pfenning, Chair of the Organic Council of Ontario, “we cannot grow Ontario organics to its full potential without similar legislation in place”. The Organic Council of Ontario has promoted such legislation as a needed tool in protecting the integrity of the organic brand. Built over a 30 year history of shared values and a commitment to transparency and traceability, the organic claim is a values contract between producer and consumer. Certification is the backbone of that trust relationship. “With the organic sector in Ontario a billion dollar industry and a growth rate of 10-15%, OCO believes the province has the duty to ensure the same marketplace protections Quebec and Manitoba farmers enjoy for Ontario’s farmers,” added Mrs. Pfenning.